Add to My Favorite Store. OMAX 20X-60X Binocular Stereo Student Microscope with Dual L ights. This is a professional low power stereo microscope with 20X and 60X magnifications. All lenses are made of high quality optical glass and the frame and the focusing mechanism are made of metal. The wide field eyepieces, adjustable diopter and interpupillary distance will definitely comfort your observation. The dual light (incident and transmitted) make it possible to examing the specimen with light shined from top or bottom. This is a good choice for professionals or students and hobbyist to examine insects, rocks, jewls, stamps or coins. There are many accessories such as USB cameras, darkfield stages, tweezer clips, which can be attached to the microscope to make it more powerful. Two magnification levels: 20X & 60X. 45°inclined binocular head on metal stand and framework. Dual lights: incident and transmitted. Diopter adjustment on left ocular-tube. Adjustable focus knob tension and inter-pupillary distance. Objectives: rotational 1X & 3X. Left ocular-tube diopter adjustment ±5dp. Interpupillary distance: 2-3/16" 2-15/16" (55mm - 75mm). Incident (upper) illuminator: 12V/10W tungsten. Transmitted (lower) illuminator: 12V/10W tungsten. Power supply: 110V (US and Canada). Dimension: 9" x 4-3/4" x 12 (23cm x 12cm x 30.5cm). Net weight: 5 lb 10 oz (2.5kg). A pair of WF20X eyepieces. We are here to exceed your expectations! 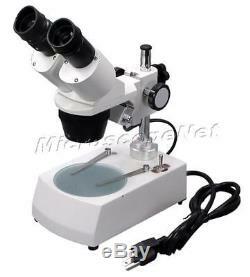 The item "Student Binocular Stereo Microscope 20X-60X with Dual Lights" is in sale since Monday, September 22, 2014. This item is in the category "Business & Industrial\Healthcare, Lab & Life Science\Lab Equipment\Microscopes". The seller is "bh542" and is located in Northeast. This item can be shipped to United States, to Canada, to United Kingdom, to China, to Germany, to Japan, to France, to Australia, DK, RO, SK, BG, CZ, FI, HU, LV, LT, MT, EE, GR, PT, CY, SI, SE, KR, ID, to Taiwan, ZA, TH, to Belgium, to Hong Kong, to Ireland, to Netherlands, PL, to Spain, to Italy, to Austria, IL, to New Zealand, PH, SG, to Switzerland, NO, SA, UA, AE, QA, KW, BH, HR, MY, CL, CO, CR, PA, TT, GT, HN, JM.